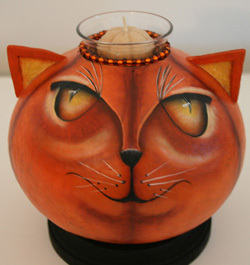 A Witch’s Party won the “Most Decorative” in Plaid’s Fourth Annual Trick Your Pumpkin Contest !! Thank-you Plaid!!! What a beautiful morning for the Endeavour to launch from the Cape and how lucky we are to be able to walk out and view the launch from our dock . Clear, cool sunny and very little wind – Godspeed Endeavor!! The last craft show was on May 7th and it was a very nice show. We had lots of visitors for May, which is usually not well attended. But the weather was beautiful and sales were good too, a nice end to the 2010-2011 season. 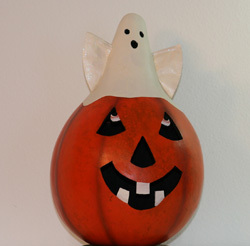 Here is a photo of my latest gourd. 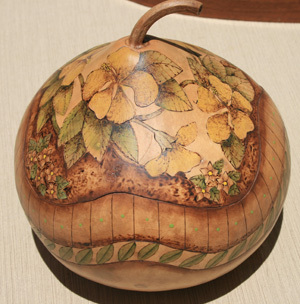 I completed this Yellow Hibiscus gourd on the Friday before the show and it was purchased at the show the very next day. I have found the pyrography or wood burning so relaxing. I just purchased a new tip for my pyrography pen and it really burns beautifully. 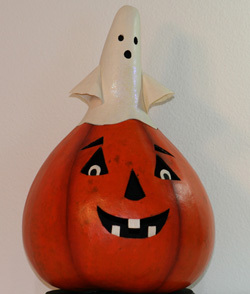 I plan on creating more of this type of gourd art for the January 2012 show. Already started on my Christmas ornaments also – a few new designs coming this year too.